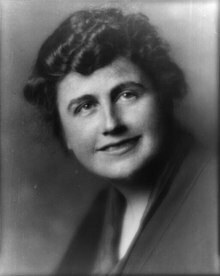 Edith Wilson (lahir Bolling, dahulunya Edith Bolling Galt; 15 Oktober 1872 – 28 Disember 1961), isteri kedua Presiden A.S. Woodrow Wilson, ialah Wanita Pertama Amerika Syarikat dari tahun 1915 hingga 1921. Dia berkahwin dengan Wilson yang ketika tu seorang duda pada bulan Disember 1915, semasa penggal pertamanya sebagai Presiden. Presiden Wilson menderita strok teruk pada bulan Oktober 1919. Edith Wilson mula menapis semua perkara negara dan memutuskan perkara yang cukup penting untuk dibawa ke presiden yang sedang sakit. Dengan berbuat demikian, beliau secara de facto menjalankan cabang eksekutif kerajaan untuk baki tempoh kedua presiden, iaitu sehingga Mac 1921. Gambar Woodrow Wilson yang pertama selepas stroknya. Dia lumpuh di sebelah kirinya, jadi Edith memegang dokumen ketika dia menandatangani. Jun 1920. ^ William Elliott Hazelgrove, Madam President: The Secret Presidency of Edith Wilson (Washington, D.C.: Regency Publishing, 2016); Brian Lamb, Who's Buried in Grant's Tomb? : A Tour of Presidential Gravesites (New York: Public Affairs, 2010), p. 119; Judith L. Weaver, "Edith Bolling, Wilson as First Lady: A Study in the Power of Personality, 1919-1920," Presidential Studies Quarterly 15, No. 1 (Winter, 1985), pp. 51-76; and Dwight Young and Margaret Johnson, Dear First Lady: Letters to the White House: From the Collections of the Library of Congress & National Archives (Washington, D.C.: National Geographic, 2008), p. 91. Caroli, Betty Boyd. First Ladies: From Martha Washington to Michelle Obama. Oxford, UK: Oxford University Press, 2010. Foster, Gaines. Ghosts of the Confederacy: Defeat, the Lost Cause, and the Emergence of the New South, 1865 to 1913. Oxford, UK: Oxford University Press, 1988. Hazelgrove, William Elliott. Madam President : The Secret Presidency of Edith Wilson. Washington, D.C.: Regency Publishing, 2016. Kupperman, Karen Ordahl. Indians & English: Facing Off in Early America. Ithaca, NY: Cornell University Press, 2000. ______. Settling with the Indians: the Meeting of English and Indian Cultures in America, 1580-1640. New York, NY: Rowman and Littlefield, 1980. ______. The Atlantic in World History. Oxford, UK: Oxford University Press, 2012. ______. The Jamestown Project. Cambridge, MA: Harvard University Press, 2007. Miller, Kristie. Ellen and Edith: Woodrow Wilson's First Ladies. Lawrence, KS: University Press of Kansas, 2010. Phifer, Gregg. Speech Monographs, Vol. 38 Issue 4 (Nov 1971). Robertson, Wyndham. Pocahontas: Alias Matoaka, and Her Descendants through Her Marriage at Jamestown, Virginia, in April 1614, with John Rolph, Gentleman. Richmond, VA: J W Randolph & English, 1887. Townshend, Camilla. Pocahontas and the Powhatan Dilemma. New York, NY: Hill and Wang, 2004. Tribble, Edwin. ed. A President in Love : The Courtship Letters of Woodrow Wilson and Edith Bolling Galt. Boston, MA: Houghton Mifflin, 1981. Tumulty, Joseph Patrick. Woodrow Wilson as I Know Him. New York, NY:, Doubleday, Page & Co., 1921. Laman ini diubah buat kali terakhir pada 13:51, 29 November 2018.